Man playing a harmonium. He is pumping the bellows of the harmonium with one hand and playing the keys with the other. The harmonium is a type of reed organ, a freestanding keyboard instrument in which air is forced by manual or voluntary means over a set of free floating reeds by bellows. Its free-floating reeds are placed in slits in a windchest, whose valves are directly activated by the keys from a traditional organ-like keyboard via a set of pushrods and/or pull rods. The typical harmonium has one keyboard, but larger models with two or even three keyboards were also built. While many of the larger European harmoniums had two manuals, the addition of an independent pedal division with a full pedal keyboard were more common in American and British models of such size. Its bellows were operated at first by a single foot lever, but later in larger models, two foot treadles (similar to those of a sewing machine) were positioned in front of the bottom of the instrument, which had to be pumped by the player’s feet. The larger organs were typically meant for church services and their much larger bellows needed to be pumped via a lever on the side by a helper. Variations in tone are produced by stops that control different sets of reeds or vary the manner in which the air acts upon them. Couplers add the upper or lower octave of each tone played. Harmoniums are of two different operating types: wind pressure was first used to sound the reeds; later a wind suction system was made popular worldwide by American reed organ makers. While the wind pressured organs were louder and thus better suited for small churches, chapels, salons, and concert halls, the suction systems were easier to build, produced a softer tone and were more suitable for use in homes. The suction type instruments developed in the United States do not have the same dynamic range as a pressure type harmonium. It is more difficult to affect the wind pressure with this approach. Their tonal characteristic is also quite different and sounds less like a real organ, as does the Débain type of harmonium called the "organino." 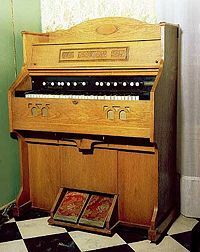 An Organino, made by the Parisian François-Alexandre Débain (1809-1877) had two notes an octave apart on each key (like 8 ft and 4 ft pipe organ stop pitches), and when Débain put four stops on one keyboard he called it a harmonium. The various sized tone channels produced different tone qualities. This was a totally new approach that would revolutionize the reed organ industry that would blossom for more than a hundred years. He obtained a patent on his invention as well as on the name “harmonium” on August 9, 1840. His instrument had free-floating reeds, and two foot treads with which to control the wind pressure. Other Parisian builders immediately recognized the importance of his innovations and reproduced both his original design and improvements. Débain spent much of his time unsuccessfully trying to assert his right of ownership. Possessing a velvety, dark timbre very much to Romantic tastes, his instruments are historically significant. In this way, Débain, placed the harmonium officially on the musical world’s map, and gave it a name that was consequently used throughout Europe and Japan. The suction system, which ultimately became extremely popular in the United States and whose approach was then consequently copied by European and Japanese builders, was apparently invented by a workman in the Débain shop around 1835. One of the great promoters of the harmonium in Holland was Johannes de Heer (1866-1961), who became a publisher of harmonium music and a dealer of the instruments (many imported from the United States). In a 1920 advertisement the firm promoted the Harmonium as a way for families to keep together and prevent youth from seeking worldly pleasures in the outside world. It was said that the home organ promotes Calvinism, Christian education, and Christian family unity. It suggested to families that it was their earnest duty to apply the means available to them to acquire such an organ. In the first half of the twentieth century, thousands of harmoniums found their way into Dutch homes, chapels, Sunday school, catechisms, and school classrooms. Johannes de Heer published an English hymnal with Dutch texts, which became very popular next to the Genevan Psalter. Johannes Worp, organist of the Martinikerk of Groningen, became extremely popular in Calvinist circles for his harmonizations of Psalms and Hymns, suitable for playing on home and church organs. Many harmonium sheet music books were published, arranged for both secular and religious music. Holland did have its own harmonium builders: Steinmann & Vierdag in Enschede, and J. Van der Tak of Rotterdam. The latter firm revealed to the public in 1896 that they finished their 10,000th harmonium. This firm was started in 1859, and thus had been producing organs at a rate of about one per day. In 1884, they started to make American type suction organs under the name of the American Organ Co. In 1854, Henry Mason and Emmons Hamlin founded the Mason & Hamlin Company in Boston, Massachusetts. Henry Mason came from a musical family. His father was the famous composer and educator Lowell Mason, a visionary who was the first to bring music into the public schools of America. As a publisher of hymns, he became known as the “father of American church music.” Emmons Hamlin was not a musician, but a brilliant mechanic and inventor. While working at the melodeon factory of George A. Prince in Buffalo, New York, Hamlin invented a way to voice organ reeds, so that they could imitate the sound of a clarinet, violin or other musical instruments. The beginning combination of limited production and capital but great attention to detail paid off, and the first instruments proved to be extremely successful. Thus the partners were well on their way to becoming major players in the field. From the organ harmonium, the company graduated to the American Cabinet Organ, a product that would earn Mason & Hamlin first prize at the Paris Exhibition of 1867. The fact that a small American company won the top prize over their much larger, more established European competitors astounded the music world. The fact that they continued to win year after year was even more astounding. It wasn’t long before Mason & Hamlin had established a worldwide reputation for excellence. Many European firms then started to copy the Mason and Hamlin way of making such reed Organs. The first Indian harmonium was apparently built by Dwarkin, who established a workshop in 1875. The most widely-known and used free-reed aerophone instrument in India is the harmonium and had been imported from the West. No foreign instrument, however, has caused such a commotion as the harmonium and none is used so extensively, be it in classical, light, film or folk music. It is probably the most commonly used instrument in northern India. The harmonium was brought to India either by Western traders or by religious missionaries and musicians in the late nineteenth century. It was first introduced and included within Indian music compositions in the west Bengal area, and from there it spread all over the country. The harmonium of India is not the heavy and large pedaled instrument of Europe, but has been reduced to a small portable box, which is approximately two feet by one foot and about nine to ten inches high, the back of which opens to act as the bellows. On the top is a keyboard like that of a piano, but with a much smaller range, usually of about three octaves. It is played by the right hand, while the left works the bellows. The Indian harmonium is a keyboard instrument on which twelve semitones of the tempered scale are fixed in all the three octaves: mandra, madhya and tara. On these keyboard instruments, only straight notes can be played with grace notes and quarter-tones not being possible. There is also no possibility of a slur, meend, or gamaka being played on the harmonium, which creates the main essence of Hindustani music. This manner of performance is essential to maintain the spirit of Hindustani ragadari system. Yet, it is possible to preserve the continuity of the music to some extent by a skillful handling of the bellows and finger pressure on the keys. 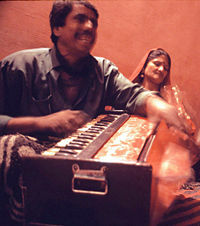 When the harmonium is paired with the human voice or the sarangi's sound, the coupling creates the unique and exquisite Hindustani music. Although the Indian scale of music of twelve semitones is nearly the same as that in Western music, there are certain vital and perceptible differences between the two. The Indian concept of "swara" does not relate it to a specific pitch point, but to a pitch-range with variegated possibilities of shades and nuances. No keyboard instrument can respond to this concept of "swara." For these reasons, the harmonium was banned in music broadcasts over the National network from March 1, 1940. Some purists like Ameer Khan, Bade Ghulam Ali Khan, Begum Akhtar, etc., went on to even favor the harmonium as an accompaniment as against the sarangi, because they found its notes were unsagging and constant. Its uncanny popularity, therefore, led the government to seriously review the question of its use in broadcasts of classical and light music, and ultimately in October 1970, after an exile of over three decades, the government had to issue a directive partially removing the ban on the harmonium in the broadcasts of classical and light classical music on the national network. Though the harmonium is not used as much in the current "Carnatic" music system, its current version is capable of providing a whole range of tonal excellence which is rare in other instruments. A top quality harmonium has two, three and even four sets of reeds. The instrument covers three to four "octaves," encompassing sub-bass, bass, medium and high. The instrument is larger and has built-in devices to filter the air through two compartments. The merit of this arrangement is that when the air is blown into it, it does not strike the reeds aggressively. From the airtight compartments, the wind emerges softly through the reeds when a key is pressed. In earlier days, the instrument was equipped with only a single piece reed board. This made the sound strident and harsh. Present-day harmoniums have three reed boards joined together with the provision for air-release in a zigzag fashion, ensuring softness of tone and melody. Although the harmonium was a popular instrument in the late-nineteenth and early twentieth century, its decline in popularity started gradually in the early 1900s, but far more rapidly after World War II. According to Alfred Berner in 1950 (see The New Grove Dictionary of Music and Musicians), this decline “was due to a change in musical taste. Music in the home as well as musical education in general turned increasingly away from the musical style of the 19th century.” The Organ Reform Movement, which affected the way pipe organs in churches were built and heralded a return to the classical building techniques and stylistic approaches, mainly focused on the Baroque era. This concentration on the Baroque sound and technique was sometimes called the Neo-baroque style and undoubtedly contributed to the demise of high romantic music in favor of earlier and more polyphonic compositions. Berner further explains: “The harmonium and everything connected with it fell under the heading of 'kitsch.' Even in light music it was ousted by its more wieldy cousin, the accordion.” Moreover, the advent of the first electronic organs, which were easier to play (no pumping involved) and the piano, which became more and more affordable, replaced the harmonium. Only in conservative religious circles was it able to survive somewhat into the 1970s. Ironically, just when the harmonium had reached its peak technically and musically in the early twentieth century, it suddenly found itself obsolete due to changing tastes and new competing electronic technologies and affordable pianos. By the 1950s, reed organ manufacture had stopped in Europe and the United States, and continued in minor ways in Japan until 2001. Only in India are the Indian Harmoniums still being made by several manufacturers. Builders and educators worked together in the development of teaching methods. Many fundamental reed organ stops, such as Melodia and Diapason which were found on American type organs, were given numbers on their stop labels. These numbers appeared in musical compositions so that beginning players knew what the composer or arranger had in mind. Much orchestral and oratorio music were actually arranged for the harmonium. Although much music was arranged for the harmonium, such as transcriptions of organ works, oratorios, popular music, and even some piano music, several composers wrote serious music for the harmonium reed organ, which is still being played on pipe organs by organists today. Known as a prolific composer for the pipe organ, the German organist-composer, Sigfrid Karg-Elert (1877-1933), is probably the most prolific writer for the reed organ, and wrote 27 known opus works. Karg-Elert also compiled instructional manuals and registration rules for the harmonium, such as "Das Harmonium und die Hausmusik" (1906), and "Die Kunst des Registrierens fur Harmonium" (1911-1914), on how to use the stops. Karg-Elert was a great proponent of the so-called and popular Kunstharmonium (Art-Harmonium) developed by the French company Mustel in the last decades of the nineteenth century. It is reputed that this instrument had better musical capabilities than its American counterpart. Karg-Elert admired this instrument very much, since its complexity of manufacture offered him a highly variable tone-color palette with considerable means of mechanical expression. At the start of the twentieth century, he therefore wrote many compositions for the instrument from short to full-scale sonatas. His publisher, Simon of Berlin, who possessed a Kunstharmonium, encouraged him in this effort. To help promote the Mustel Kunstharmonium, Karg-Elert was often invited to give concert tours, both at home and abroad. His music became popular in England, the United States (where he gave concerts), and Australia. While largely forgotten after his death in 1933, his music is enjoying renewed interest since the end of the twentieth and start of the twenty-first century. The following is a short list of some of the most important composers, in addition to Karg-Elert, who have written for the harmonium, either in solo usage or in combination with other instruments: Jehan Alain, Cesar Franck, Gustav Mahler, Antonin Dvorak, Alexandre Guilmant, Theodore Dubois, Léon Boëllman, Franz Liszt, Max Reger, Charles-Marie Widor, Camille Saint-Saens, Gioacchino Rossini, Johannes Worp, Louis Vierne, Richard Strauss, Arnold Schoenberg, Dmitri Shostakovich, Percy Grainger, Georges Bizet, Alexandre Dumont, Cor Kee, Louis J. A. Lefébure-Wely, Nicolas-Jacques Lemmens, Alphonse Mailly, Johann Strauss, and Samuel Wesley. Many harmoniums were destroyed, or lay damaged in garages, sheds, warehouses and attics. Yet, many have survived, including the larger ones with 2 manuals and pedal keyboard. Around the turn of the twentieth century there was a sudden revival of interest. People came to realize that these harmoniums were beautiful pieces of furniture, and they were placed in many homes as a conversation piece, but not played. Others realized the musical features of the instrument which further warranted the attention of the public. The fanatic Organ Reform Movement which introduced a flourishing Early Music Movement in the late 1900s, was then replaced by a more inclusive and embracing way of thinking. The vast heritage of nineteenth century church organs now begged for preservation, restoration and musical attention, which has given rise to a growing interest in romantic music. This has helped the public turn back to the harmonium as well. Not only have many harmonium museums been established in Europe and the United States, but in the Netherlands, and other European nations, harmonium concerts are becoming more and more common. Professional artists and restorers are bringing many dilapidated instruments back to life. A growing number of composers have written new music for the instrument, and even pop music bands include them in their concerts. Radio and TV broadcasts are not uncommon. CDs are being produced. The increase of harmonium clubs around the world, for example in Europe, United States, and Japan, is on the rise. In many digital music samplers, the harmonium/reed organ is included. In this way the harmonium gets the attention it deserves: an instrument with its own character and music. Canada Organ Co., London, Ont, ca 1865-? John Jackson and Co, Guelph, Ont., fl 1872-1873, 1880-1883? Mudge & Yarwood Manufacturing Co., Whitby, Ont., 1873-? David W. & Cornelius D. Smith, Brome, Que, 1875-? Edward G. Thomas Organ Co., Woodstock, Ont., 1875-? Ahrens, Christian, and Jonas Braasch. 2003. “Christian Gottlieb Kratzenstein: de uitvinder van de orgelregisters met doorslaande tongen” (Christian Gottlieb Kratzenstein―the inventor of organ stops with free reeds). Het Orgel 99 (4): 32-36. This page was last modified on 1 August 2017, at 22:16.